«What type of messenger are YOU? Q: What are your best time management tips? How can I find time to take care of myself — i.e. exercise, get everything done and keep up on industry reading. A: Great Q. You must make yourself a priority. How you do this will vary depending on your schedule, family commitments, dedication to your health and well-being as well as learning style preferences. I tend to batch my time to leverage and maximize productivity. Let’s break it down based on your question. It’s best to start with self-care because you cannot give from an empty cup. So, you must make sure you’re eating nutritious foods and carving out time for YOU. Self-care is my TOP priority. Because I spend a lot of time at the computer I try to walk at least 1/2 hour each day. When it comes to finding time to exercise, even a short, brisk walk is better than not moving. Getting “everything done” is a matter of priority. It’s smart to realize that you’ll rarely get everything on the to-do list done and sometimes trying isn’t healthy. Using a planning system to prioritize is an efficient way to track what needs to get done and to re-prioritize and course correct when needed. This can be a computerized calendar like Outlook or Gmail or you can find the perfect physical planner. I currently use The Desire Map Planner from Danielle Laporte and focus on three KEY things that I want to accomplish each week. To help with time management, I batch calls, errands and personal time whenever possible. I schedule preferred client calls on Tuesday and Thursday. Wednesday is a dedicated writing day. I assign other tasks, meetings and projects on Monday and Friday. You can bend time and get more done by leveraging. I often leverage my exercise time and learn on the go. I do this by downloading Audible books onto my smart phone and listening while I walk. You can also listen to industry podcasts and more while you’re exercising. If you’re not yet an Audible member, I highly recommend investing in this service so you can learn on the go (click on the graphic below to get started). Another great way to stay up to date on marketing and messaging trends is to join the Write On Creative Community. If you’re not yet a member, join here and discover how to create marketing messages with integrity with a focus on PASSION points not pain points. 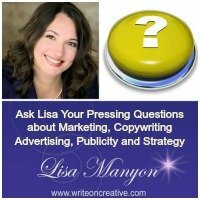 This entry was posted in Ask Lisa	on Monday	November 30, 2017 at 4:31 pm. You can follow any responses to this entry through the RSS2.0 feed. You can also leave a response. Liked your idea of batching calls and errands, also listening to podcasts while working out, this is something I am going to start from tomorrow. This will save a lot of time. There is one change that I have made in my work schedule, earlier I planned my time for work which never worked as per plan because of some or the other obstacle. Now I have stopped doing that, now I have daily productivity goals with a small reward attached, if I meet all of them. It has worked really well, as I work with lots of focus and get them all done quickly.